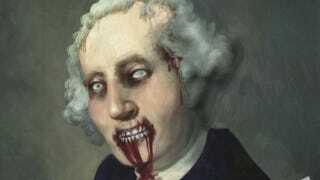 George Washington may have been America's first president, but was he nearly America's first zombie-in-chief? If William Thornton, physician and designer of the US Capitol, had had his way, Washington's body would have been subjected a scientific experiment designed to bring the deceased former president back to life. Image: Zombie George Washington by Plemon Studios. Zombie president prints available on Etsy. In December 1799, 67-year-old George Washington took a ride through the wet winter rain and, shortly afterward, developed a fever and a sore throat. When his condition became so bad that Washington could no longer swallow the concoctions of vinegar, molasses, and butter with which he was trying to treat himself, Washington called in his livestock and slave overseer, who drained three-quarters of a pint of blood from the ailing man. When bleeding failed to have the desired effect, three physicians were called in, all of whom recommended emetics and — you guessed it — more blood to be drawn. Over the brief course of his treatment, Washington's stomach and bowels were repeatedly evacuated and the puncture-happy docs took nearly two and a half liters of blood. Just two days after that fateful morning ride, Washington closed his eyes for the final time, after telling his doctors, "I die hard, but I am not afraid to go." But Washington's body was not buried immediately after his death. The president may not have feared death, but he did fear being buried alive. Before he died, he commanded his secretary, Tobias Lear, to make sure that he would not be entombed less than three days after he died. In accordance with Washington's wishes, his body was put on ice until it could be moved to the family vault. That's where the story gets a little strange. The morning after Washington died, his step-granddaughter Elizabeth Law arrived with a family friend, William Thornton. History best remembers Thornton as the architect who created the original design for the Capitol building, but he was also a trained physician, having studied at the University of Edinburgh. Although he did not practice medicine for much of his life, Thornton always had a keen interest in the workings of the human body, and he suggested a novel method for resurrecting the fallen warrior. Thornton told Washington's wife Martha that he wanted to thaw Washington's body by the fire and have it rubbed vigorously with blankets. Then he planned to perform a tracheotomy so he could insert a bellows into Washington's throat and pump his lungs full of air, and finally to give Washington an infusion of lamb's blood. Friends and family declined Thornton's mad scientist offer, not because they thought his solution impossible, but because they felt the nation's first president should rest in peace. So what gave Thornton the idea to play Dr. Frankenstein? Susan E. Lederer, author of the book Flesh and Blood: Organ Transplantation and Blood Transfusion in Twentieth-Century America, notes that many physicians in the late 18th Century believed that lamb's blood had special properties, and believes Thornton meant to give Washington's circulatory system "a spark of vitality" that might jolt him back to life. But Paul Schmidt, in his article "Forgotten transfusion history: John Leacock of Barbados" published in the British Medical Journal, suggests that the University of Edinburgh may have been on the forefront of transfusion research (unless you count all those transfusion experiments in 17th-Century France). Thornton wasn't the only Edinburgh alum thinking about blood transfusions during that time period. Philip Syng Physick, an earlier Edinburgh grad (who incidentally practiced in Philadelphia, where Thornton himself briefly practiced medicine), is reported to have performed a human blood transfusion as early as 1795. John Leacock, a later graduate, performed successful transfusion experiments, believing an infusion of blood would "excite" the recipient heart. Leacock's experiments in turn influenced James Blundell, who is credited with introducing the process to the mainstream medical community. Schmidt wonders if the Edinburgh community took particular interest in those early French transfusion experiments, planting the idea in Thornton's mind. Oddly, reanimation wasn't Thornton's only thwarted plan for Washington's body. Thornton secretly included a burial vault in his designs for the Capitol, hoping that it would be Washington's final resting place. After Washington's coffin was placed in the family vault, Martha did agree that he could be later removed to the Capitol, on the grounds that her body could join his when she died. Alas, the transfer of burial chambers, like zombie Washington himself, was not meant to be. Story discovered via Holly Tucker's book Blood Work: A Tale of Medicine and Murder in the Scientific Revolution, which details a series of blood transfusion experiments undertaken more than a century before Washington's death. Lamb, Brian, Who's Buried in Grant's Tomb? : A Tour of Presidential Gravesites, PublicAffairs (2010). Lederer, Susan E., Flesh and Blood: Organ Transplantation and Blood Transfusion in Twentieth-Century America, Oxford University Press, USA (2008). Schmidt, PJ, "Forgotten transfusion history: John Leacock of Barbados," BMJ. 2002 December 21; 325(7378): 1485–1487. Scwarz, Frederic D., "The Death of Washington," American Heritage, 1999 December; Vol 50(8). Tucker, Holly, Blood Work: A Tale of Medicine and Murder in the Scientific Revolution, W. W. Norton & Company (2011).